This is a Civil Defense Message for Friday, August 3 at 6:15 p.m. The Hawaii Police Department reports that Waikoloa Road is now open to traffic. Motorists will have to take a left turn onto Mamalahoa Highway (Route 190) (toward Waimea) as Mamalahoa Highway (Route 190) remains closed south of Waikoloa Road. Daniel K. Inouye Highway remains closed from the 43-mile marker west to Mamalahoa Highway (Route 190). Old Saddle Road is open to traffic. Mamalahoa Highway (Route 190) remains closed from Waikoloa Road south to Puulani Ranch. Mamalahoa Highway (Route 190) is open to local traffic only from Kaiminani Road north to Puulani Ranch. Please drive carefully as there may be smoke on the roadways. Thank you for your attention. This is a Civil Defense brush fire road closure update for Friday, August 3 at 3:00 in the afternoon. Highway 190 between the Old Saddle Road junction and Kaiminani Drive. Hwy 190 between Kaiminani Drive and Puu Lani Ranch is open to local traffic only. Waikoloa Road between Waikoloa Village and Highway 190 junction. Daniel K. Inouye Hwy between the Old Saddle Road junction and Hwy 190 junction. For motorists traveling Hilo to Kona, use Hamakua to Waimea or Daniel K. Inouye Hwy to the Old Saddle Road junction at Mile Marker 43 detour to Waimea. Waimea through Kawaihae to Queen Kaahumanu Hwy is open. Motorist traveling south, Hwy 11 is open. Additionally, fire crews are responding to a structural fire at the Queen Shops in Waikoloa. The extent of the fire is unknown at this time. Stay alert and away from this area. This is not related to the Waikoloa brush fire. 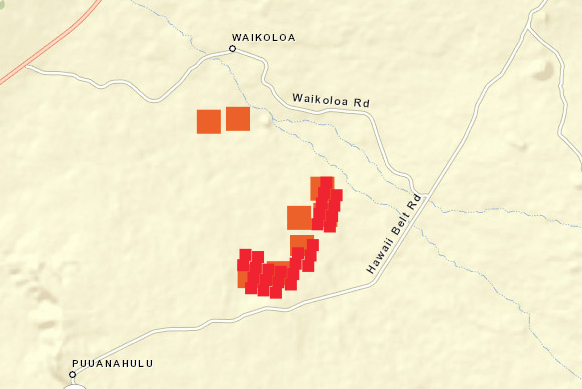 This is a Civil Defense Brush Fire Road Closure update for Friday, August 3 at 5:30 a.m.
Mamalahoa Highway (Route 190) between the Old Saddle Road junction and Kaiminani Drive. Waikoloa Road between Waikoloa Village and Mamalahoa Highway (Route 190) junction. For motorists traveling Hilo to Kona, use Hamakua to Waimea or Daniel K. Inouye Highway to the Old Saddle Road junction at Mile Marker 43 detour to Waimea. Waimea thru Kawaihae to Queen Kaahumanu Highway is open. Motorist traveling south, Mamalahoa Highway south (Route 11) is open.